Habanero peppers pack a flavor that teams up quite well with fruit. Shamelessly stolen by me from Dave DeWitt’s article Perfectly Pungent Peaches at our sister site, Fiery Foods and Barbecue Central, this recipe is a sure hit for any chilehead who’s big on frozen with their fire. 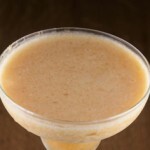 In a blender, combine the peaches, lime juice, and chile and puree. Add the rum, sugar, and crushed ice and puree until smooth. Pour into stemmed glasses and garnish with mint sprigs.